The Beijing carrier will start the Dublin-Shenzhen service on 25 February. 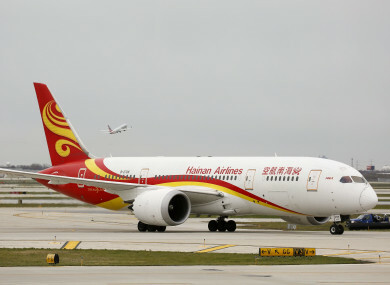 BEIJING-BASED HAINAN Airlines has announced its second direct route from Dublin to mainland China – but there are concerns over the logistics of operating the flights during the peak summer season. The airline has confirmed plans to launch a non-stop service from Ireland to Chinese hi-tech hub Shenzhen on 25 February. A Dublin Airport spokesman welcomed the announcement. The twice-weekly route will operate on Mondays and Fridays and will be serviced by a Boeing 787 Dreamliner aircraft, which will provide flatbed seating and other such perks for its business-class passengers. Economy class tickets are currently selling from €436 to €521 one-way. There are concerns over the logistics of operating the service during the peak travel period. An aviation source said there are some logistical issues that have yet to be resolved relating to the allocation of slots during the busy summer season. Slots are managed independently of DAA by the Commission for Aviation Regulation and private operator Airport Coordination Limited. Ireland got its first direct route to mainland China in June 2018 when Hainan rolled out a four-times-weekly service, which was scaled back at the end of October. The flights had operated as non-stop service between Dublin and Beijing for two days of the week, while the other two flights include a stopover in Edinburgh. From 28 October, Hainan reduced the frequency of the service, operating a direct Dublin-Beijing service twice a week and flying from Dublin to Beijing via Edinburgh once a week. Following the launch of the flight, one official at Fáilte Ireland – which has encouraged businesses to embrace the arrival of wealthy Chinese tourists – likened the launch of direct air services to the region to “Ireland in the 1970s when we started selling Killarney to the States”. According to figures supplied by the national tourism development agency, an estimated 70,000 Chinese tourists visited the country in 2017. Although this was almost double 2014′s tally, that represents less than 1% of total international visitors. The State agency previously estimated that with the arrival of Hainan and Cathay Pacific’s Dublin-Hong Kong service that figure would reach 175,000 by 2025. Hainan Airlines was established in 1993 and carried 72 million passengers to 110 destinations in 2017, making it China’s fourth biggest airline by passenger numbers. It is part of the HNA Group, which owns Dublin-based aircraft leasing firm Avolon. Email “Hainan Airlines is launching a second direct route from Ireland to China”. Feedback on “Hainan Airlines is launching a second direct route from Ireland to China”.